Symphony is on a rampage! Just after unveiling the fingerprint enabled device, the Symphony H400, they have announced the all new Symphony ZVII. According to the two photos posted by the company, the device will only cost BDT 12,490. 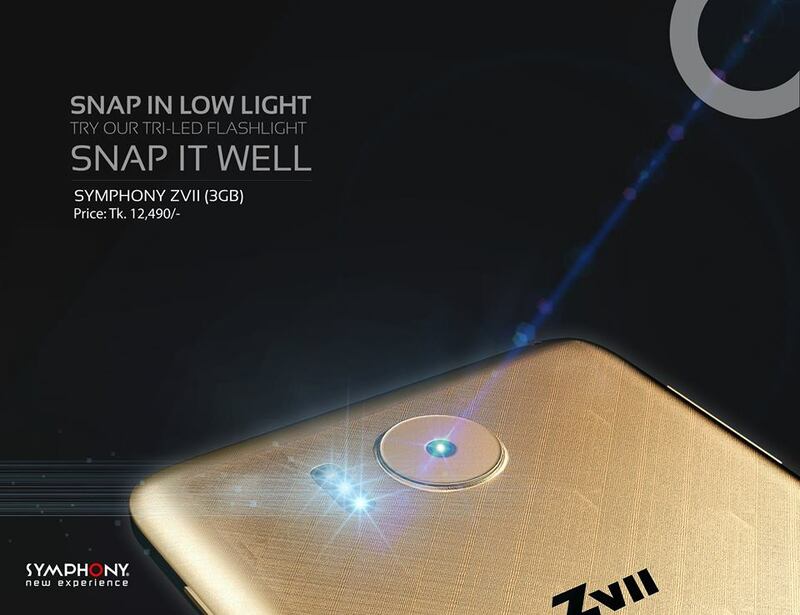 There are a lot of changes from the previous Symphony ZVI and most importantly, the launch price is cheaper than what Symphony ZVI had at launch i.e BDT 14,990. The device is showing up with a 5.5-inch Full HD display and is armed with a 1.3GHz Cortex Octa Core Processor and a 3GB RAM to run the show. With the lastest Android 6.0 Marshmallow as it’s OS, the device will only have a native 16GB of space for storage with almost 4GB to be swallowed by the OS. For the camera, the device will have a 16MP rear camera and a 5MP camera at the front. Compared to the previous Symphony ZVI, the latest device receives an upgrade in the battery arena housing a 3000 mAh unit. All in all, Symphony ZVII is a worthy upgrade from the previous ZVI and the best part, it carries a price tag of BDT 12,990. Currently, it’s still not available in the market and we will update you as soon as we get information regarding it.